Embedded systems in recent year are becoming large-scale with multifunction. Amid improvement of design productivity is required in semiconductor device development, we propose the model base design method, “UML (Unified Modeling Language) to RTL” with own hardware description language (NSL: Next Synthesis Language) and its synthesis engine. This new technique is to connect UML diagram used in the upstream process of product development with RTL written by the existing hardware description language seamlessly through behavioral description with the high degree of abstraction level used in NSL. 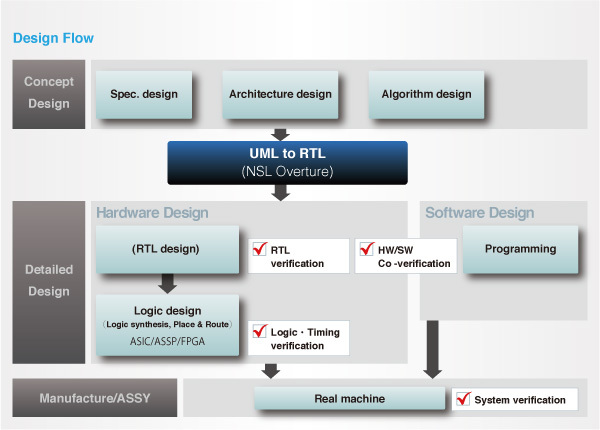 With this new technique“UML to RTL”, it improves the productivity of engineers and also to realize the competitive advantage to enhance the critical architecture design capabilities in upstream process of product development. Eventually you are able to gain significant competitive advantage. In addition, it can smooth out the transmission of information between the parties by sharing design information of specifications and features in the development group. Homogenizing of outputted RTL code file. In fact, a beginners’ class engineer can realize the optimal circuit (speed performance and scale) which is the same as an expert level. It is not necessary to design and to manage individually of RTL model (Verilog HDL/VHDL/SytemC). Able to consolidate design property such as IP core by means of NSL model. Able to create handily the hardware software Co-verification environment by outputted SystemC model. Reduction in their man-hour cost of design that is enhance their business competitiveness. Enhance the design efficiency of upper process, such as architecture and algorithm design, so enhance their business competitiveness. “NSL Core” is a behavior synthesis engine for our NSL code file, which generate RTL format file (Verilog HDL, VHDL, SystemC). The model (IP core) which was developed by UML/NSL.